Love this rasam for its simplicity! predominantly tasty because of the homemade rasam powder(you can refer my homemade rasam powder recipe given here). In most of the South Indian houses after a wholesome festive meal they used to have rasam in a glass!this is mainly for digestion,even after having it(rasam) in the regular meal. The garlic and hing are added mainly to avoid unnecessary digestive problems and actually it is a receiver of such problems.Rasam are one of the remarkable fares of South Indian cuisines.Despite the fact that there are many varieties of rasam I personally have a strong feel of affection to this simple rasam.I usually squeeze the tomatoes instead of chopping it to get maximum flavor.Adding jaggery is optional but it tastes great with it. 1.Rinse tamarind in water for some time. 2.Squeeze tamarind and take the extract,keep ready. 3.Now keep ready with all the ingredients list and keep a kadai and add oil. 4.Add all the ingredients listed except the extract. 5.Saute nicely and then add the extract,adjust the sourness by adding needed water. 6.When every thing tastes good add chopped coriander leaves and when white foam forms switch off the flame. Rinse tamarind in water for some time. Squeeze tamarind and take the extract,keep ready. Now keep ready with all the ingredients list and keep a kadai and add oil. Add all the ingredients listed except the extract. Saute nicely and then add the extract,adjust the sourness by adding needed water. When every thing tastes good add chopped coriander leaves and when white foam forms switch off the flame. When white foam forms if you leave it then will start to boil. Be careful not to let the rasam to bubble out. If it starts to bubble the rasam loses its aroma. 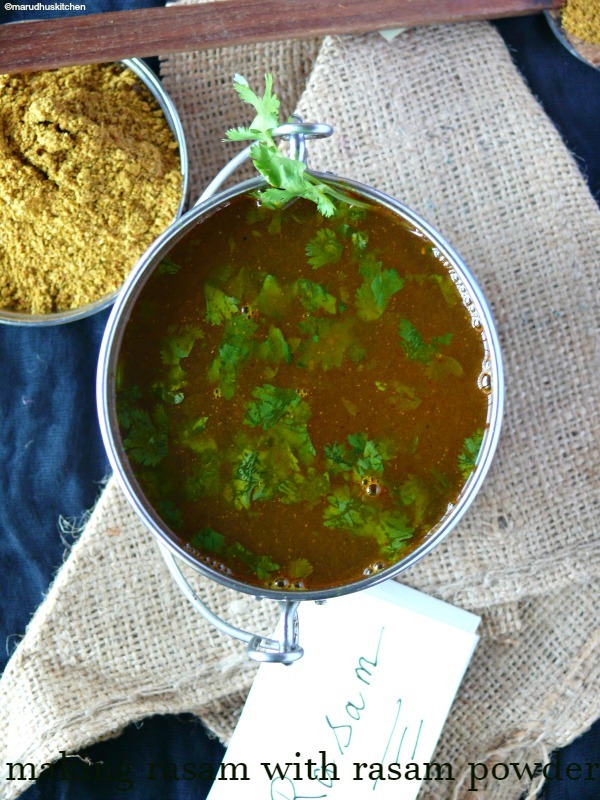 When adding tamarind the correct amount should be added to get nice flavorful rasam. I usually squeeze the tomatoes instead of chopping it to get maximum flavor. Adding jaggery is optional but it tastes great with it. I love Rasam, one of my favourites from South Indian cuisine. I love the simplicity of your dish which will make each flavour stand out. I also love the garlicky tangy flavour and the aroma of hing. I love it. Oh!! What a comfort food!! Pls pass me a bowl!! Nice one! Rasam is one of my fav too. 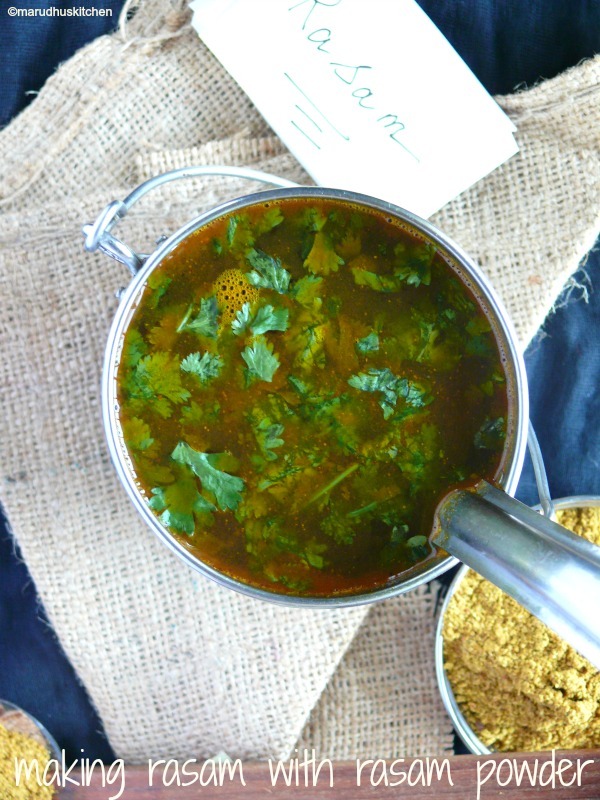 Garlic gives it that extra punch to the already flavourful rasam.